The situation is less pleasant for these two... They're in the principal's office being severely lectured for their bad school results. 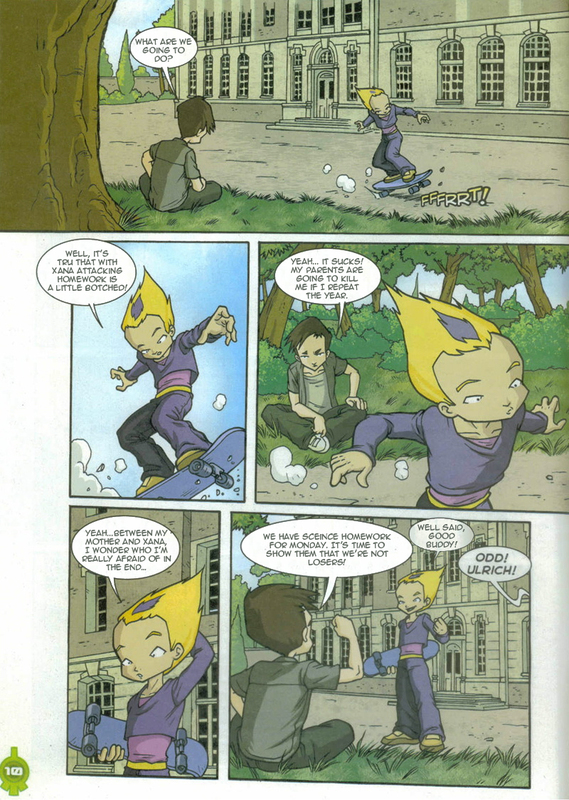 Ulrich is quite upset by his warning, while Odd does some carefree skateboarding. Ulrich talks to him seriously, ill-at-ease and Odd sympathises. The two teens end up agreeing to seriously study for their next lot of science homework on Monday. When Jeremy and the two girls arrive back at school, they discover a very worried Ulrich. 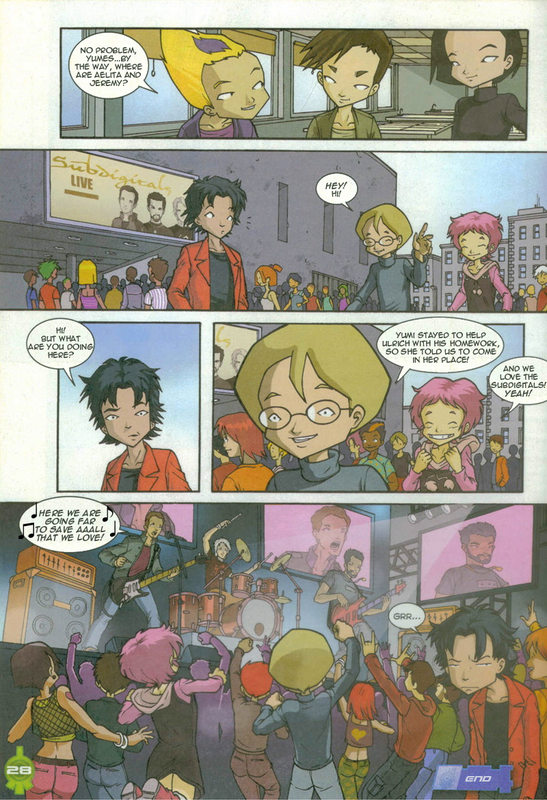 While Ulrich studies, Yumi offers to help him and is very coldly rejected. She then leaves, tears in her eyes. No sooner as she's left the room does she run into William, offering her tickets for a Subdigitals concert. Hesitant at first, Yumi's eyes meet Ulrich's. The two teens grow angry and Yumi ends up accepting. But in Jeremy's room, much more worrying events are preparing... His computer beeps... In a science lab, Ulrich and Odd are preparing their famous exposé on bees. They don't even really have time to do it... The glass case the bees are in is XANAfied and the insects regroup to form a humanoid monster. Ulrich and Odd courageously flee...overwhelmed by this far-too-powerful character. They hide in a cupboard and call Jeremy... He describes their situation. 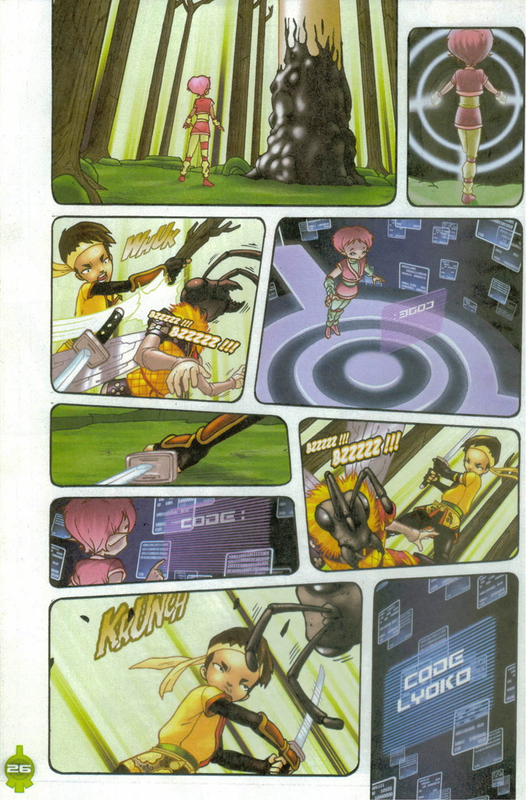 The two Lyoko Warriors land in the Forest Sector... But Yumi has fused with the bee: she has virtualised as a hideous bee monster... Half-bee, half-human... Apis sapiens. And aggressive to boot! 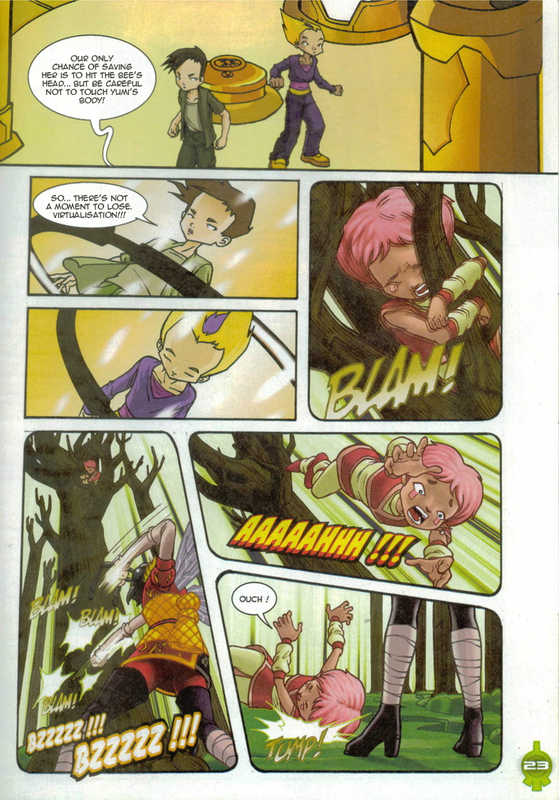 Aelita runs away and seeks refuge in the branches of a tree (we're in the comic, don't forget). She calls Jeremy for help. But the genius boy can't help, he's defending himself against the angry bees, with the help of a fire extinguisher. On their end, Ulrich and Odd try to get to the factory: they've made a little detour. However, they burst into the lab and save the day, spreading manure around them. The infectious odour spreads, the bees flee! They fear the powerful smell of the manure. Jeremy, covered in carbon dioxide, thanks them quickly but hurries them to the scanner room. Banging against the tree forcefully, the Yumi monster makes Aelita topple out of her hiding spot. It doesn't have the time to attack the girl however: the two boys appear. With her heart in her throat, Aelita runs towards the tower. The monster surprises the two heroes with its speed: flying, it disarms Ulrich with a powerful backhand and steals his sabre! The two heroes then lose sight of it when it flies between the trees... When it reappears, it impales Odd on his friend's sabre! 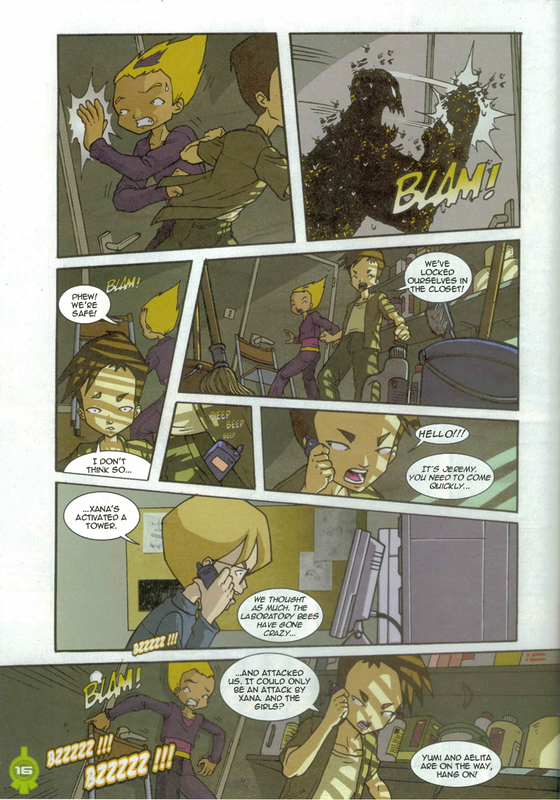 But the danger is already over: Aelita reaches the tower and types in the Code Lyoko. Ulrich still has time to knock the Yumi-wasp out with a branch and get his sabre back to devirtualise it. Yumi reappears in the scanner just before the return to the past is launched. Back in time, Ulrich kindly accepts Yumi's offer to help with his study and the two teens make up. - Attack: XANAfy Ms Hertz' bees. - Enemies met: Yumi…merged with a bee. - The scanners stay open during the virtualisation process. - The trees in the Forest Sector have branches. - The tower interface is on the first level. - Aelita's bandages are inversed just before she enters the tower. 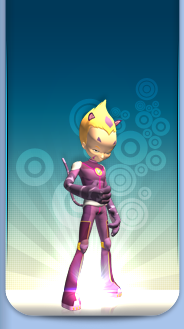 - On Lyoko, Aelita's shoes are white at the moment when she climbs a tree, and her earring is white instead of red and grey. - The hem of William's pants is the same colour as his pants instead of being a lighter colour. - Aelita's boots are pink instead of red and white when she's on the factory bridge with Yumi. 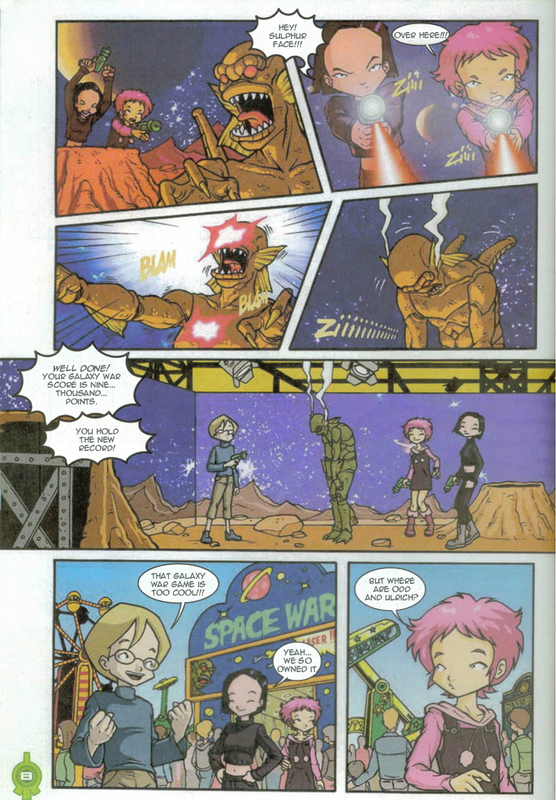 - The game at the start of the comic is said to be Galaxy War, but the writing on the sign says Space War. 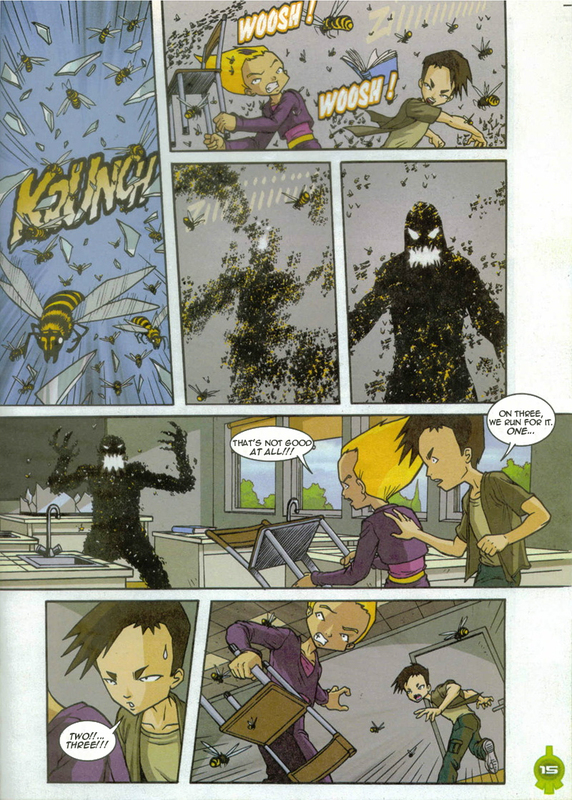 - This attack strongly resembles the one in episode 12 “Swarming Attack” when XANA took control of hornets in the park. - This comic seems to take place during season 2. 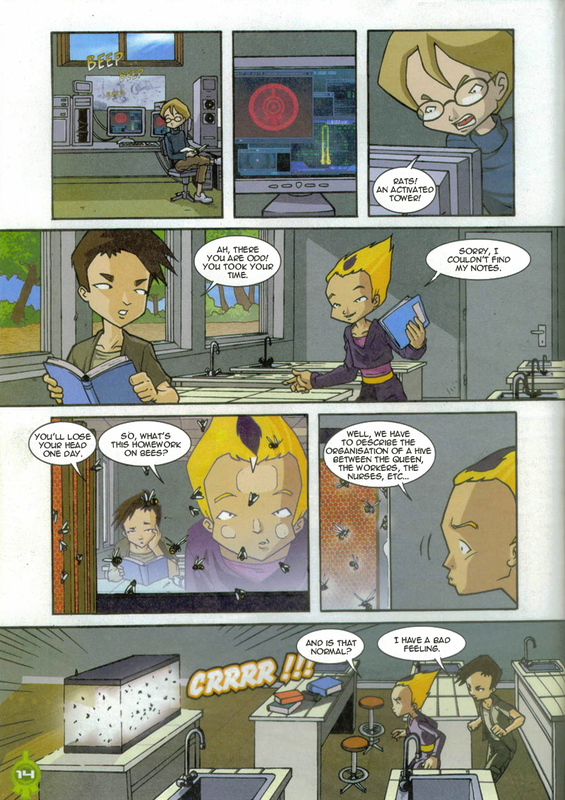 Aelita and William are both on Earth and Aelita doesn't yet have her energy fields. - Title invented for the sake of the gallery. The comic doesn't actually have one. Ulrich: On three, we run for it. Odd: Hey! Bee! Wouldn't you rather forage over here? Ulrich: Don't forget Odd. Only hit the head, if not you could hurt Yumi. Odd: No worries, good buddy! William: But what are you doing here? Jeremy: Yumi stayed to help Ulrich with his homework, so she told us to come in her place! Aelita: And we love the Subdigitals! Yeah! 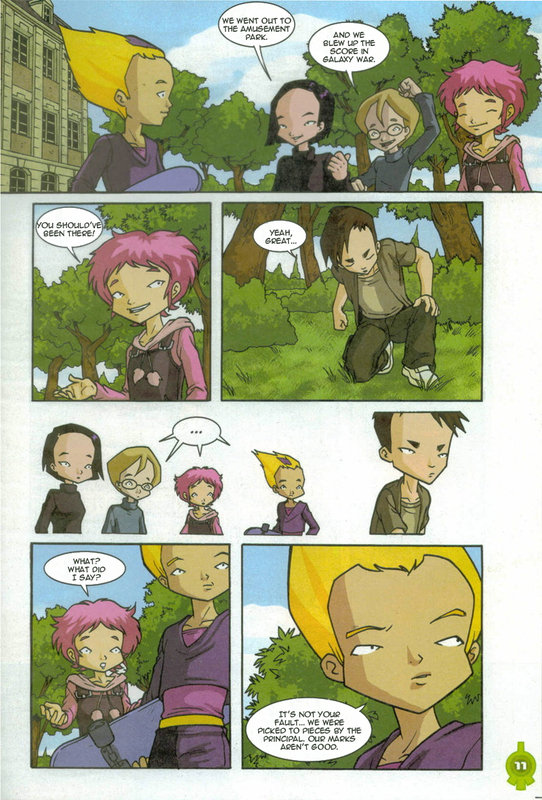 Jeremy and Aelita: Here we are, going far, to save all that we love!